There was a full moon in the night sky on Monday ( and it is still only just past its gibbous best ) but I have loaned my telescope in Jerez to friends who live in the campo and are, therefore, untroubled by the ambient light of the city. London, of course, is even worse. Yet the surface of the moon is clear right now and one can make out its surface features. The image, left, is of the near side of the moon in the third quarter. A lunar watcher with a telescope would have be able to see Craterus Alfonsus, the lunar crater named for King Alfonso X. 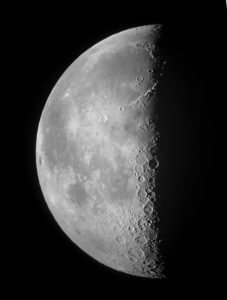 In the image it is just to the left of the shadow, only just over half way down, the middle crater in a vertical series of three. Crater Alfonsus sits below Crater Ptolomaeus, above Crater Arzachel and to the right of Crater Alpetragius. 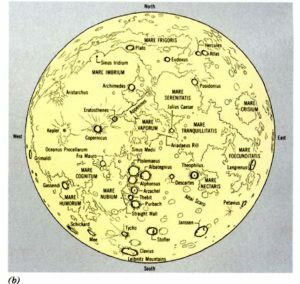 See the cluster of craters on the map to the right ( slightly lower than in the image ). The Mare Nubium, or Sea of Clouds is close by. Thus the King sits between the ancient astronomer, Ptolemy ( 90 – 168 ) who calculated, amongst other things, the distance from the earth to the moon, the Toledan astronomer and instrument maker, Arzachel, or Ibn-Zarqala ( 1029 – 1087 ), who modified some of Ptolemy’s calculations in his Book of Tables and Alpetragius, or Nur ad-Din al-Bitruji ( d.1204) probably from near Cordoba, who challenged Ptolemy’s system of the planets. Each of these remarkable individuals deserves a story of their own. The Alexandrian Ptolemy, a Roman citizen probably of Greek origin, was a polymath; a mathematician, geographer (Columbus used his Geography on his trans-Atlantic voyage to find a western passage to Asia), astronomer and natural philosopher. Arzachel was forced to flee Toledo when in 1085, Alfonso VI, an illustrious ancestor of our King, took the city – he probably died in a refugee camp – Chaucer mentions him as Arsechieles. We know least about Alpetragius’ life, but he was a contemporary of Averroes/Ibn Rashd, also a Cordoban, and he probably played a part in that city’s vibrant intellectual life in the late twelfth century. The Moon has always inspired stories, myths and tales. Named Selene, Luna, Diana or Cynthia in western mythologies, its changeability has suggested lunacy or instability as well as, conversely, its regularity providing accurate means of measuring time. The earliest fictional visit to the moon was in the second century CE by Lucian in his Icaromenippus, but such visits did not really become popular in fiction until Ariosto in the 16th century, with his Orlando Furioso. The discovery of the telescope in the 17th century prompted a new fictional interest, though it was the great adventure stories of Verne and Wells which lead modern fiction and eventually Sci-fi. King Alfonso commissioned his set of Tables which drew on much extant astronomical knowledge, enabling future astronomers to calculate the motions and positions of the planets. We know that Copernicus used these Tables when developing his heliocentric model of the solar system, because his own copy survives, complete with his annotations. 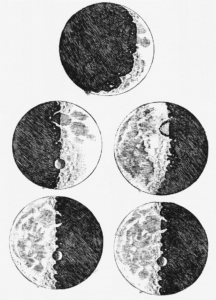 As does the personal copy of the Alfonsine Tables belonging to Galileo Galilei, who, in 1609, drew the surface of the moon, using one of the first telescopes, showing its craters and mountains ( see left, from Galileo’s Sidereus Nuncius ). Soon after it was mapped and the nomenclature we recognise today, that of Riccioli and Grimaldi, was adopted. Originally the crater was named ‘Alphonsus Rex’. The crater has a mount at its centre, known as Alphonsus Alpha and its floor is criss-crossed by a series of rilles. It was seriously considered as the possible landing site for the Apollo 16 and 17 missions, though it has been the site of some interesting, if transient, lunar phenomena, like the apparent emanation of glowing reddish clouds. This, it has been suggested, is evidence of volcanic activity on the Moon, but it is not a widely accepted theory. 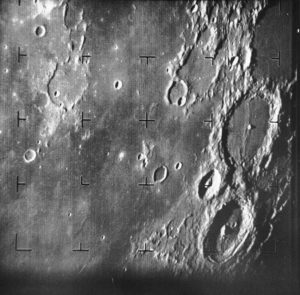 The image of Craterus Alfonsus, right, was taken by Ranger 7, one of the Ranger series of NASA probes which sent live pictures back to earth in the 1960s. The crater is the upper circle in the ‘8’ shape it seems to form with Crater Arzachel. Ranger 9 impacted into Alfonsus at just after two in the afternoon on March 24th 1965. 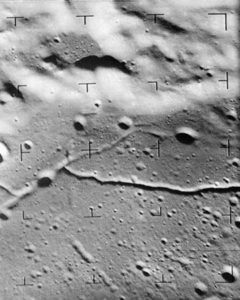 It gave us the close-up photographs of the rilles on the craters surface, see left. How these were formed is currently unknown. I tend towards the ‘bubbling up of the green cheese’ theory myself ( the green cheese being an ancient tale in itself ). 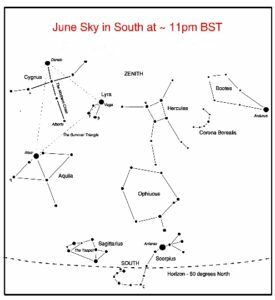 Right now in the night sky the ‘Summer Triangle’ of Deneb ( Cygnus ), Vega ( in Lyra ) and Altair ( in Aquilla ) is clearly visible. To the East is the brightest star in the heavens at present, Arcturus, which, readers of ‘Reconquista‘ will recall, is as far as Atta got when he began naming the stars and constellations to keep himself awake. Of course, he fell asleep and fell off his pony. If you enjoyed reading this article you might also enjoy Heavenly Music Provender The Wrong Saint?